So much yarn, so little time. 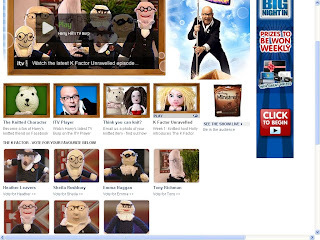 : Meerkat Harry Hill on UK TV! Finally my secret is out! Harry Hill's TV show is holding a knitting competition - the K factor. This is what they said: "If you think you’ve got the K Factor, email in a photo of your knitted item and we’ll choose our favourites to feature on the show each week. You’ll be able to vote for your favourite each week and the overall winner of the K Factor Final at the end of the series will take home 8 balls of wool, a TV Burp book and DVD, a bag of Harry’s Nuts, your very own knitted character and the coveted K Factor Trophy. " 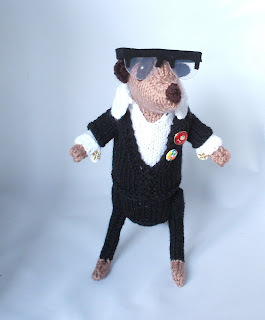 Last week's winner was the fabulous Tommy Trundle, designed by Alan Dart, this week they chose to feature just knitted Harry Hills...and I received a request to send in my little knitted chappy! Here he is on the sofa with lots of other knitted Harry Hills and knitted Holly Willoughby. I'm told the video is only viewable by UK residents, but as soon as I spot it on youtube I will post a link! Please vote for me, Heather Leavers! Voting closes on Tuesday 23rd. 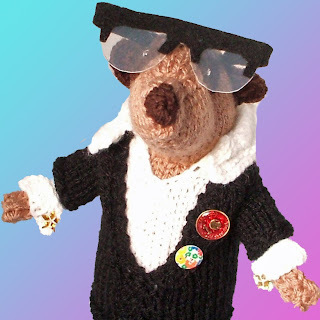 I've already received requests from fans of Harry Hill and meerkats, so expect to see him coming to my shops soon! Throwing down a vote on meerkat Harry. Best wishes Heather. Meerkat Harry Hill puts the others in the shade! Of course I'm voting for you. So exciting for you! Yours is the most orginal design and I'm sure you will win. And yes of course I did vote for you. I saw it last night and have now voted for you. Good Luck! I've voted, I love your meerkat Harry, it's definitely the most original of the lot! Nifty, after you made that spectacular Morris Dancing meerkat for me, I hope you already know how much I think you rock! I'm so thrilled about Harry! Yayyy! so exciting! I tried again, and you are right, it won't play that UK video for me (rats.) YOu have reached a new high, for sure! I'll be voting for you ~ fantastic, it made me laugh; truly brillant. You've got to win with this little fella! That was so funny! Missed it on the tele! Well done and GOOD LUCK!!! !